Aloft London Excel, the 252-room urban hotel on the edge of Royal Victoria Dock, brings a little South American spice to the iconic waterways of East London with a Mexican-inspired terrace for the summer. The Corona Terrace, overlooking the Royal Victoria Docks, will transport guests straight to the Baja California Sur. Its decked-out al fresco bar serves delicious Corona-inspired cocktails along with ice-cold buckets of its iconic bottles of beer and a wedge of lime. 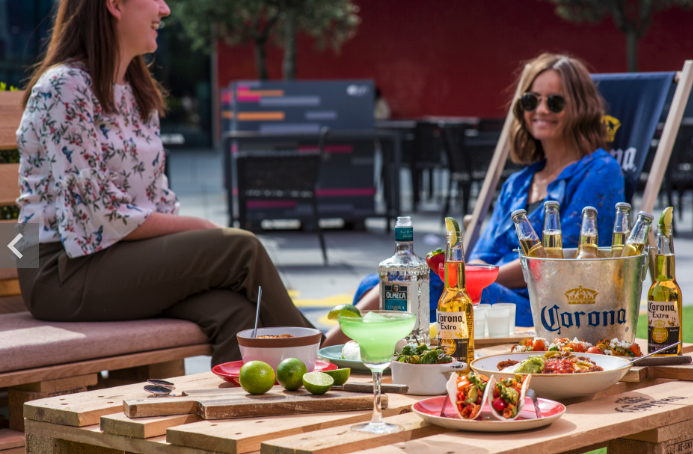 Boozy pick-me-ups such as the ‘Corona Rita’ with Corona, tequila, triple sec and lime juice or the classic frozen margarita can be enjoyed, surrounded by tropical foliage, perched on one of the pallet-style benches or laid back on one of the terrace’s reclining deck chairs. When hunger strikes, freshly-made Mexican favourites such as jalapeno mac’ n ’cheese, spicy chicken fajitas and pulled beef nachos will be the perfect choice for sharing amongst friends. A stone’s throw from London’s Excel Centre and London City Airport, the terrace will also host regular live DJ sets from up-and-coming local talent, creating the perfect ambience for guests to wind down and soak up the sunshine after a long flight or busy day networking. The Corona Terrace will be open from 12pm midday every day, weather dependent. For further information, visit the Aloft London Excel site.